Transylvania is a land of dramatic mountain scenery, idyllic rural countryside, Saxon medieval towns and villages and, of course, vampires! 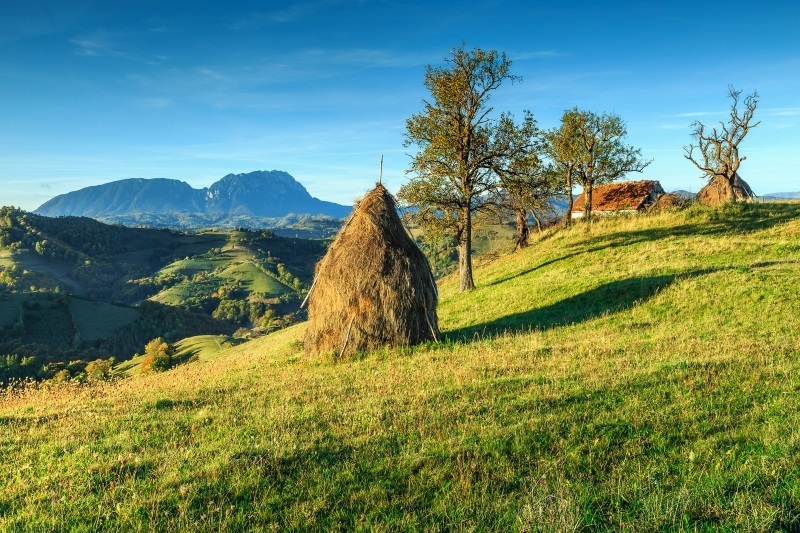 From your main base in the medieval merchant town of Brasov, there are two walks in the magnificent alpine landscapes of the Fagaras and Bucegi ranges, and a third walk in Viscri – a preserved pastoral setting unique to Romania. You also stay in Bucharest where you have a tour of Ceausescu’s colossal House of the Republic, while Bran Castle, on the way to Brasov, lives up to the eerie, ghoulish image that Bram Stoker’s Dracula evokes. Day One: Flight to Bucharest, transfer to your hotel in the centre of the city for two nights’ bed and breakfast hotel accommodation. There are plenty of restaurants in downtown Bucharest to suit all tastes and budgets. Your Tour Director will be on hand to assist. Day Two: Mid-morning walking tour of Bucharest. Romania’s cosmopolitan capital is well known for its wide boulevards and fine pre-World War I buildings that gave it the name of Little Paris. The tour will concentrate on the Old Town and the Calea Victoriei – Bucharest’s most famous avenue which leads to the beautiful Romanian Athenaeum, the Royal Palace and Revolution Square. Bucharest is also known for its stark Communist-era architecture, exemplified in Ceausescu’s monster House of the Republic, now known as the Palace of Parliament. A guided tour will show you some of 1,100 rooms of the world’s largest civilian administrative building. Day Three: Travel north through the Southern Carpathians to Brasov, stopping en route at Bran Castle. On a rocky outcrop guarding the entrance to a mountain pass, the castle was built by the Saxons in the late 14th century to defend Brasov from invasion by the Turks. Inside you’ll find displays of rich Western European furniture, which Queen Marie, grand-daughter of Queen Victoria, purchased in the 1920s when the castle was used as a royal residence. Continue to Brasov for four nights’ bed and breakfast with dinner in a local restaurant this evening. Arrival in Brasov will be late afternoon. Your Tour Director will conduct a short orientation walk of Brasov before dinner. 126 miles today. Days Four to Six: In Brasov with two included walks. Brasov is a medieval town with ornate Saxon churches and townhouses. Local legend has it that when the Pied Piper lured away the children from Hamelin, they re-emerged near Brasov’s main square, Piaţa Sfatului, in the heart of the medieval quarter.It is one of the finest Baroque squares in Romania. Here you can visit the 15th-century Town Hall, with its quaint Trumpeter’s Tower on top, and the Lutheran Black Church – the largest Gothic church between Vienna and Istanbul with a 6-ton bell and a huge organ with 4000 pipes. A great view of the old town is afforded from Mt Tampa which can be reached by cable car or by a couple of marked trails. Walk 1: Viscri. Coach transfer to Mesendorf (57 miles) for the start of the walk. This 8-mile walk (270m ascent/descent) takes you over the hills and through the meadows to Viscri. A combination of bulldozing by the Ceausescu regime and the exodus of the German-speaking population after the fall of Communism threatened to wipe out the centuries-old Saxon rural heritage in Transylvania. With the help of benefactors, including Prince Charles, restoration and preservation schemes have helped save many villages, and Viscri is the most famous example. Barns, cottages, cattle troughs, etc. have been repaired and rustic skills re-introduced. After the walk, you have an included lunch in a local house, time to explore the village and have a tour of Viscri’s UNESCO-listed fortified church. Under continuous threat of marauding Mongols and Turks, the Saxons not only fortified their towns, but the villages as well, with defensive works centred around the church. Walk 2: Walk 2: Transfer by coach to the Balea waterfall. The transfer takes 2¼ hours, which is much longer than we would normally undertake. But not only is the drive worth it, it is part of the day’s experience as it takes you on the northern part of the Transfagarasan – voted Top Gear’s ‘best road in the world’. The really serious bends are after the waterfall, but you see them in all their glory from the cable car which takes you to Lake Balea at 6,780ft and the start of the walk to climb up to the main ridge of the Fagaras Mountain. The narrow path is mostly uneven, on rocky terrain, with steep sides. On the ridge, there are panoramic views over the glacial valleys and lakes wherever you look. You continue along the ridge and then descend back to the Lake from the opposite side on similar terrain. (2½ miles with ascent/descent of 480m). During your stay in Brasov there will also be an optional half day excursion to the nearby fortified churches of Harman and Prejmer. Day Seven: Return to Bucharest. Twenty-four miles south of Brasov is the small mountain resort of Busteni where you start your third walk. Walk 3: The Bucegi Mountains.This part of the Prahova Valley gained popularity as a tourist destination at the end of the 19th century when KingCarol I established royal residences in the area. You take the cable car from Busteni to the Babele station (7,350ft) passing the giant WWI memorial cross on Mt Caraiman. Babele is famous for its curiously shaped rock formations. With spectacular views across the valley, your walk (which is 5 miles with ascent of 150m and descent of 300m) takes you south to the Cota 2000 station where you take the cable car down to Sinaia and re-join your coach for the onward journey to Bucharest (90 miles) for your last night on a bed and breakfast basis. Day Eight: Free time until your departure for the airport and your flight home. Please note: Some flights do not arrive until the small hours and there is an early start for the Bucharest City Tour or the journey to Brasov depending on your arrival day. Please check when you book. Departures on 2 & 22 June, and 29 September spend the first and last two nights in Bucharest. This means that you depart for Brasov on Day 2 and your Bucharest City Tour will be on Day 7. If you have friends who are not walkers interested in this itinerary, we also offer it with a touring programme.